It's time! It's time! It's time! It's time for the second annual L.M. Montgomery Reading Challenge here at Reading to Know. I've been eagerly anticipating the start of this challenge. Last year I spent a lot of time reading and learning about Montgomery herself, so this year I'm happy in the thought of spending time with her characters. I STILL haven't decided exactly which books of hers I'll be re-reading, although I have gotten started with Jane of Lantern Hill . We'll see where I go from there. 1. Pick the Montgomery book (or books!) that you most want to read and then read them during the first few weeks of January. **NOTE: I decided against using Mr. Linky for a variety of reasons. One very big reason you'll discover below. Just leave a comment below with a link to your introductory blog post and we'll call it good. ** Your introductory blog post does not need to be excessively long or grand. You merely need to create a blog post saying, "I'm in!" and link it up here in the comment section. If you'd like to say which books of Montgomery's you plan on reading during the challenge, do so then! There are a great many to choose from. 2. Come back on Sunday, January 31, 2009 and leave a comment "linking up" to however many Montgomery related reviews/posts you like. Isn't it beautiful? Anne (and Lucy Maud) loved beautiful things and this locket just makes me smile. So one of you will win the locket AND a chain for it. Typically I keep my contests around here nice and easy but this one is going to take a little bit more work because, well, I think it's worth it. How can you win this beautiful locket? 1. You can sign up to participate in the L.M. Montgomery Reading Challenge. As a reminder of how to do this - you create a blog post linking back to this one from your site. You don't have to write up a long post. Just something that indicates that you intend to participate in this challenge. By signing up and leaving a comment below, you'll gain one entry. Any or all of these will gain you extra entries for this contest. 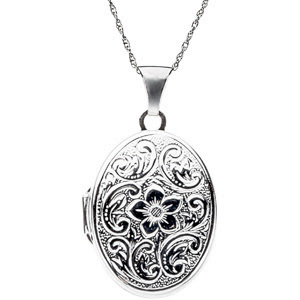 Yes, I intend to be a bit stricter with this contest but it's a gorgeous locket, I bought it, and I'm making the rules. ;D haha. And trust me, I'm perfectly DELIGHTED to be able to gift one of you with it with my best blessings attached! So go forth - make some new literary friends and maybe, just perhaps, you'll receive a beautiful gift as a further reward for your reading progress! I can't wait to get started. Count me in. It's too late for me to decide tonight which books I will read....I will have to think on that for a while. I'm in!! I'm going to read Anne of Avonlea. I really like the Panache Freshwater Cultured Pearl Double Strand Bracelet from Emma Parker & Co. I'm a sucker for pearls. I can't wait! I'm already enjoying Pat of Silver Bush (again!). I'm going out for the day, so I'll have to come back and do the other stuff later. Have a great first day of 2010, Carrie!! I just went to the bookstore and got Anne of Green Gables, and a friend is sending me her copy of Anne of Avonlea. I think garnet is the perfect color of red, and I love them set with diamonds. I love the Three Color Ion Plated Steel Necklace,it is beautiful. Thanks for such a generous prize offer, Carrie! I am in too! I am reading Anne of Green Gables next week, as part of my 52 books in 52 weeks challenge (on my create corner blog http://createcorner.blogspot.com/). I have joined in. What an excellent challenge! I'm in! Here is my post. I thought I already commented but I don't see it. Hmm... strange. Well, here goes again! I'm in, and I think I dragged Amanda back in too! I reminded her how we both read Anne of Green Gables last year, and told her that you were doing the challenge again, and did she want to read the 2nd Anne book. "I guess. I really should," she said. I told her she didn't have to, and she said she wanted to. Fun. I'll write up my post soon. Oh, and that Chocolate and Gold Ion ring on the front page of Emma and Co is beautiful. I like the Sterling Silver necklace with pink crystals as I wear a lot of pink, but I also like the Murano Glass pendant with the rose heart, the Murano Glass Heart Necklace, and several of the heart-shaped lockets. I got the Anne set for Christmas and hope to read a couple for the challenge. I also hope to read Story Girl. The jewelery is beautiful. My favorite ring that I could consider is 38112, sterling...and the one I would never get is 480...a beautiful ruby. Thanks for the challenge - I'm in! You can find my intro post at http://almostunschoolers.blogspot.com/2010/01/lm-montgomery-reading-challenge-2010.html...I think I'll start with Anne of Green Gables, but I have to think about it a little. So many beautiful designs! I like the black leather cord with steel ovals and the ion plated steel flower necklace with cubic zirconia. I love L. M. Montgomery, but I haven't read any of her books for years. Count me in! On the Emma Parker & Co site, I think I'd have to say, I like the cultured pearl and heart bracelet the best. I'll definitely read "Rainbow Valley", but hope to add one or two more books! NICE jewelry at her site ... I really like the CZ necklace http://www.emmaparkerdiamonds.com/catalog/product_info.php?products_id=38101. Oh, I like the fact they're having a 50% Off Valentines Sale! I like these pearl earrings. They're so pretty. I'm new to your blog and in on the challenge!
. . . Emily of New Moon is (always) my choice. Hmm, they're in my price range . . . I'm in. I am reading Anne of Green Gables! I've finished reading Anne of the Island (my post came out a little gloomy - but I really loved the book). My second post is at http://livelearnlove226.blogspot.com/2010/01/meet-maud.html I thought I had already shared it here, but apparently not! I just read Anne's House of Dreams! SO lovely! I'm really enjoying the series, and I'm pretty sure I wouldn't be reading through it now, if it weren't for this challenge - so thanks again! I finished reading Anne of Green Gables. We had some fun with an Anne of Green Gables inspired craft today. It's so much fun to see the children warming to the story. My daughter and I are reading Emily of New Moon together. I just finished Anne of Ingleside (my favorite so far!). I am so sad that I'm just finding this NOW!!! This will be a good book to share with the kids! I've decided to read Emily of New Moon. I've had this book in my home library for over a year but it sounded so similar to Anne's story that I put off reading it. Now I'm glad I've begun reading it. I mentioned your challenge on my latest blog post. I had a good time reading books I hadn't read before. Thanks! Thanks again for the challenge - this book alone made it worth the effort. And, I can't wait to watch the movies with the children now! Our Emily post is here. Anne of Green Gables was the first book I read on my Kindle. I knew I wouldn't get more than the first one done in January, but at least by starting the series (which I never read while growing up) I am at least heading in the right direction. By the way, I was looking back at your comment on Amanda's review of Anne of Green Gables (which is again linked within my review above), and she mentioned Much Ado About Anne, which I think that you should definitely read next year in conjunction with your LMM Challenge, because you still haven't, right?? One more entry for me: I like the sterling silver and pink crystal bracelet! thanks! I posted my review of "Anne of the Island"; this is a sweet one. THANKS for the challenge. I wouldn't have read this otherwise and it's gotten me excited to read more of the series. I would love to join the challenge! Here is my post.